As long as there have been Deaf people on earth, they have helped each other by explaining or interpreting to ensure that all members of the Deaf community have access to information. 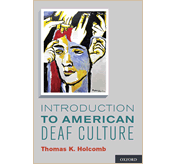 This often-overlooked facet of Deaf culture is currently receiving much well deserved attention in a variety of settings. 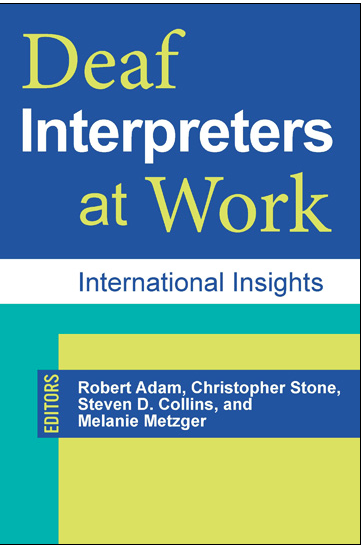 In a new book, Deaf Interpreters at Work: International Insights, published by Gallaudet University Press, four distinguished editors and 17 contributors document the historical roots and current practices of Deaf interpreters in Australia, Canada, England, Finland, Ireland, Sweden and the United States . 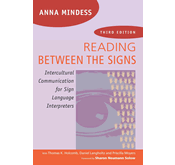 While the professionalization of hearing people earning their living as sign language interpreters has eclipsed the traditional role played by Deaf people within their own society, there is currently a momentum for Deaf interpreters (DIs) to reclaim this traditional cultural role and work alongside hearing interpreters in the hospital, courtroom or on the conference stage. 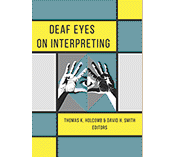 In the Introduction to Deaf Interpreters at Work, the co-authors acknowledge that while DIs and hearing interpreters both follow a formalized code of conduct, there are crucial differences between them, including “the fact that DIs are Deaf all of the time…[consequently] DI and hearing interpreters have dissimilar access to information; DI and hearing interpreters have a different relationship with Deaf culture in that the former have more confidence in their position in that culture than do the latter.” The authors also describe a division of strengths: “DIs have a better understanding of sign language nuances, hearing interpreters have a better understanding of spoken language nuances…” (Adam et al. 2014, 7). 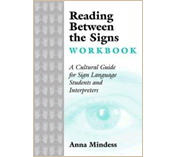 In my own work specializing in legal interpreting for the past 20 years, I have had the privilege and pleasure to work with many highly skilled and creative CDIs (Certified Deaf Interpreters) in an array of challenging situations. I believe that this configuration can often achieve a deep accuracy not possible when hearing interpreters work alone. For Deaf and hearing interpreters to work together successfully, however, they need training in a specific type of teamwork. Last week, I attended a three-day intensive conference in Denver which focused on Deaf and hearing interpreters working together effectively in the legal setting. The turnout at the ILI (Institute for Legal Interpreting) demonstrated a historical show of strength and a growing acknowledgement of the necessity for and power of Deaf interpreters. Of the 220 attendees, there were 54 CDIs from across the country. For more details see this post on Street Leverage. Speaking of history, the attendees at ILI were treated to a fascinating presentation by Anne Leahy, a graduate student in Salt Lake City, who shared her historical research on Deaf interpreters being used in several court cases going back to the mid 1800’s. I look forward to Anne publishing these intriguing stories when her research is complete. Posted in Deaf Culture in Action, Deaf Interpreters and tagged Deaf community, Deaf Culture, Deaf interpreter, Deaf interpreters, ILI, interpreters, street leverage. Bookmark the permalink.